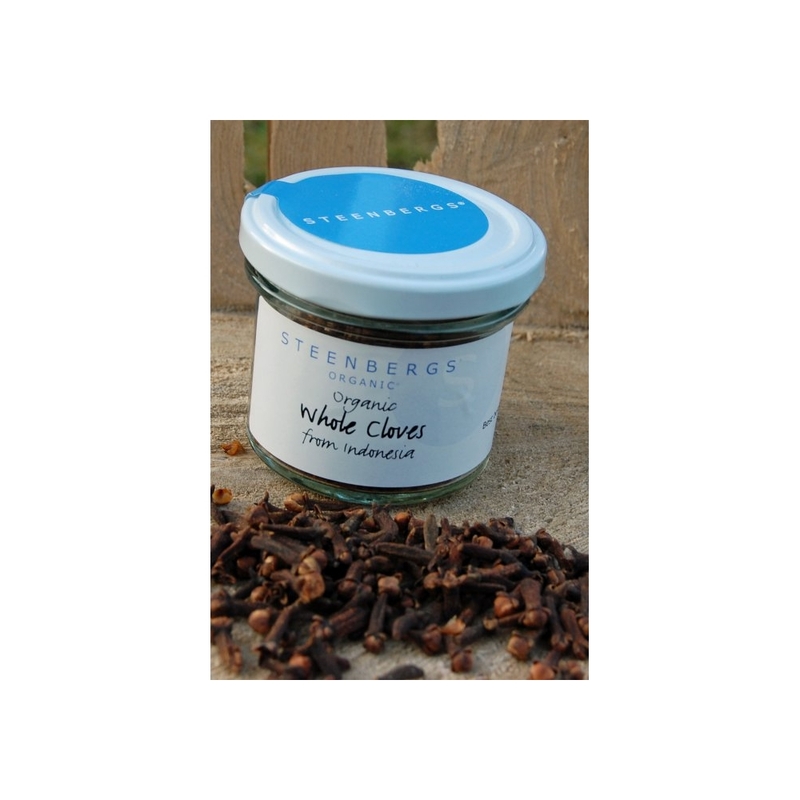 Steenbergs Organic Cloves are the classic, nail-like spices that originate from the Spice Islands in eastern Indonesia and now come from many places, including India, Indonesia or Sri Lanka. Native to Asia, organic cloves are the dried small reddish-brown flower bud of the clove tree, which are picked before the flowers actually open and then dried in the sun. 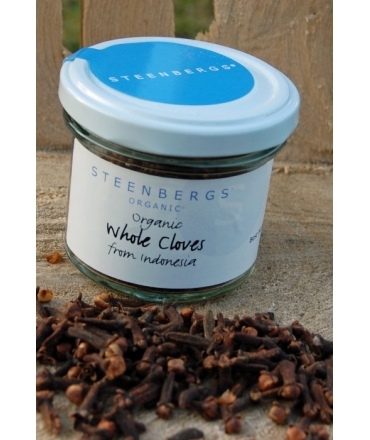 Cloves are reddish brown to brown in colour and are 10-15mm in length (⅓ - ½ inches). They are long and nail shaped, tapered at one end and with a flatter head at the other end, which should contain a friable little ball held between the fingers, hence its name in German being nelke. 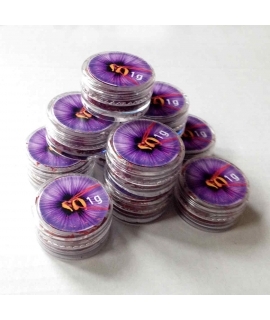 The flavour is intensely pungent with ideas like medicinal, warming, sweet and numbing coming to mind, while the aroma is also really strong, being pungent, aromatic, camphorous and peppery. Clove trees begin to be harvested when they reach somewhere between 6 and 8 years and remain productive until 50, or maybe even 150 years. Clove clusters are hand-picked when the clove buds get to full size, but prior to any of the clove petals fallen off and exposing the stamens. This is a matter of careful timing as - like all things natural - they do not all reach the right stage for harvesting simultaneously, hence the harvesters must pick the best clove clusters as they become ready. The filled baskets are taken to a central collection area, where the flower buds are removed from the flower stems using a motion that twists the cluster against the palm of the hand. The snapped off buds are then air dried on woven mats, letting them dry out in the glorious tropical sunshine for a few days, while the buds become brittle and turn from yellow-green to a deep reddy brown colour. As in most things spicy, it is during the drying process that an enzymatic reaction does all the magical things that make spices so amazing - enzymes create the volitile oil, eugenol, the core flavour in cloves. Having lost about 70% of their weight in the drying process, 1kg (2lb) of dried whole cloves will contain about 15,000 buds. When buying cloves, you should look for clean, well-presented buds.